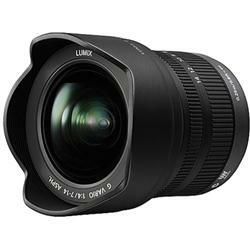 The Panasonic Lumix G Vario 7-14mm f/4 Lens is an ultrawide suitable for landscapes, interiors, cityscapes, and vistas. When mounted on a Lumix G camera, an advanced contrast AF is available in addition to normal AF, which is smooth and precise. Note that this lens is compatible with Micro Four Thirds mount cameras. It is not compatible with Four Thirds mount cameras. The focal length equivalent in 35mm format is 14-28mm. • This lens is compatible with Micro Four Thirds mount cameras. It is not compatible with Four Thirds mount cameras. The focal length equivalent in 35mm format is 14-28mm. • This lens does not accept front screw-on type filters.